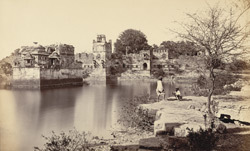 Photograph of Padmini's Palace in Chitor Fort from James Burgess' 'Photographs of Architecture and Scenery in Gujarat and Rajputana' taken by Colin Murray in c.1872.The citadel of Chitorgarh was the capital of the Mewar kingdom from the 8th to the mid-16th Century under the Sisodia Rajputs. The mighty fort is remembered for the 3 bloody sieges, the last one in 1567, when Emperor Akbar took possession of the fort. The Palace of Padmini, situated inside the fort, is a three storey building with a small pavilion, standing in the middle of an artificial lake.